New Bethlehem remains a charming community with grand old single family homes and hometown values nestled among tree-covered hills along the Redbank Creek in Southern Clarion County. New Bethlehem has a central tri-county location, about 20 miles from each of the County Courthouses and hospitals of Clarion, Jefferson and Armstrong Counties and is only about 60 miles from Pittsburgh. The downtown area lies at the intersection of State Routes 66 and 28 with easy access to Interstate 80. Come to visit, you just may want to stay. ? Click on the title below to see more information. Dogs must be licensed and are not permitted to roam at large. They must be leashed when not on their owner’s property and must be under their control. New Bethlehem licenses may be obtained at the Clarion County Court House and at Beverly’s Diner. South Bethlehem licenses may be obtained at the Armstrong County Court House. Owner’s must remove waste left on public or private property. Dead animals on state roads can be reported to the Pennsylvania Department of Transportation, Clarion County division at 1-800-FIX ROAD (1-800-349-7623). This 24-hour monitored number may be used to report hazardous road conditions, including potholes or ice. New Bethlehem building permits should be obtained from the Zoning Officer; appointments are appreciated (814) 275-3377. Permits are required for demolition, new construction, additions and/or improvements. Intended construction or uses that do not comply with zoning requirements must be approved by the zoning board. South Bethlehem permits may be acquired from the Borough Secretary (814) 275-4079. The nearest DMV office is located at the Clarion Mall. Please call for hours as they are limited as to day and services provided. Refer to www.dmv.state.pa.us or call 1800-932-4600 for current requirements to obtain or renew a driver’s license as they have become more complicated and require various forms of proof of residency. New residents who hold a license from another state should obtain their PA drivers license within 60 days after moving to PA. The local Pennsylvania Emergency Management Coordinator (EMC) is Edward F. Goth at (814) 275-3224. A plan has been adopted by the council and is updated regularly by the EMC. The plan provides for a line of command, operations and procedures and available resources in the event of emergencies or natural disasters. Three mass care centers are designated in the event of disasters: the Fire Hall at 425 Arch Street, the New Bethlehem Presbyterian Church at Penn and Wood Streets and the First United Methodist Church at Penn and Lafayette Streets. The Emergency Operations meeting location is the New Bethlehem Fire Hall, with the Alltel Building as the secondary location. Alert procedures include siren activation by the fire department, door to door notification, loud speaker notification or other means deemed appropriate by emergency personal. In a County emergency, listen to your local radio stations for instructions. 2. Sirens are located on the New Bethlehem Fire Hall and Municipal Building to call firemen, fire police and emergency medial technicians with a 3-minute long warbling siren for fires, accidents and health emergencies. A one-tone steady siren sounds to notify the community of dangerous conditions for which everyone should seek a safe place immediately, such as tornado or floods. If sufficient emergency personnel do not respond within 3 minutes, Clarion County sets off a second alarm. A short burst signifies an all clear signal. 3. Test Sirens – A 3-minute test siren is sounded on Saturdays at noon, and on the 2nd Monday of each month at about 7:30 PM for local testing and again at 7:40 for County testing. The New Bethlehem area is served by 3 local hospitals, several in the Pittsburgh area and local medical centers. Clarion County provided an emergency service (911) which is locally based on Penn Street. Armstrong County Memorial Hospital (724-543-9500) is located in Kittanning, Armstrong County (24 miles south) and is accessible off the West Hills exit of Rout 422 West. Brookville Hospital (814-849-2312) is located at 100 Hospital Road., 18 miles north off Route 28 in Brookville, Jefferson County. Clarion Hospital (814-226-9500) is located off exit 9 of Interstate 80 to the left behind the Clarion Mall at One Hospital Drive, Clarion pa 16214, 18 miles North on Route 66 to Route I-80 West, one exit to the Clarion Exit ((old exit 9). Each hospital offers some free seminars and services, including occasional health fairs and flu shot clinics, including several in New Bethlehem. The library is located at 720 Broad Street, New Bethlehem – (814) 275-2870. The library board meets the 3rd Wednesday of each month at 7 pm in the library community room. The community room is available to the public for meetings and special events for a small fee. The library is full services PA certified and is a member of the Clarion County and Oil Creek District Library Systems. Free and expended library services, included passport services, are provided to all residents of 8 municipalities including New Bethlehem, Hawthorn Borough, Porter and Redbank Townships in Clarion County and South Bethlehem Madison and Mahoning Townships in Armstrong County. Please support New Bethlehem public library. All donations are greatly appreciated and tax deductible. The Leader-Vindicator is a local newspaper and an important source of local information, public notices and meeting dates. It is published on Wednesdays. The telephone number is 814-275-3131, and their website can be found at http://www.TheCourierExpress.com. Other local newspapers include The Derrickat http://www.TheDerrick.com, The Leader Times and the Clarion News athttp://www.TheClarionNews.com. The Post Office is located at 451 Broad Street in New Bethlehem at (814) 275-3303. Parking is available on Broad Street or alongside the building. Full service hours are 9-5 M-F and 9-Noon on Saturday. Self serve hours are M-F 6:30am – 5pm, Sat 6:30am-4pm Closed Sundays and Holidays. Boxes are provided for a fee, but are not accessible when the post office is closed. Ordinances require that snow be removed from sidewalks within 10 hours after snowfall has stopped or in New Bethlehem by 10am of the following morning. Failure to remove snow allows the Borough to remove the snow from walks at the cost of the owner of the adjoining property. Please keep walks clear to allow safe passage of pedestrians and school children. During heavy snowfalls or ice storms, residents are asked to park off-street as a courtesy to street crews and so that snow might be removed and ice treated more effectively. New Bethlehem is served by the Oli City office (Venango Co.) located at 42 Senenca Street, Oil City. Hours are 8:30 – 3:30 M-F, 1800-722-1213 or 814-676-9293. The Kittanning office (Armstrong County) is located at 159 Butler Road, Highland Business Center, Suite 2B, West Kittanning, Pa 16201. Hours are 9-4 M-f, 1800-722-1213 or 724-548-5666. The Social Security website is www.SocialSecurity.gov. Chemicals, oil, paint and other hazardours materials may not be disposed of in the municipal collections for the protection of residents, municipal employees, contractors, equipment and the enviroment. Hazardous materials may be disposed of at the County collection sites. Additional information may be found a 1-800-CLEANUP (1800-253-2687) or www.1800cleanup.org. Recycling information is available at (814) 266-4000. Please keep the Boroughs and properties clean. Dumping or littering is illegal and attracts vermin. Title 75, part 3, Ch. 37, section 3709 of the Vehicle Code provides for a fine of up to $300 for dropping, throwing or depositing any litter, waste or refuse upon any highway or upon any other public or private property or waters without the consent the owner. 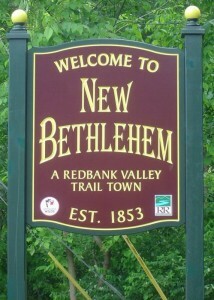 New Bethlehem. Household waste is collected each Wednesday. Residents should place trash curbside for collection on Tuesday evening after dusk in sealed bags or containers. Residents should bring in an trash cans promptly after pickup or by no later than the evening of collection. Residents are billed quarterly in advance so that for example, the bills for October, November and December are billed and to be paid in October. Payments should be made payable to New Bethlehem Borough and may be sent to the address on the bill or dropped off at the Jewelry Shop or at the Borough Building drop box at 210 Lafayette Street. Residents are limited to 5 bags or equivalent per pickup or may be subject to an additional charge for excess trash. There is no municipal recycling at the present time. Leaves should be bagged and placed curbside for pickup any day except the regular Wednesday pickup. Bags will be collected periodically though the Fall. Burning leaves or other trash is not permitted in New Bethlehem between the railroad corridor, now trail, and the river by town ordinance for safety. South Bethlehem. Household waste is collected very early on Saturday. Residents should place trash for collection curbside on Friday evening in sealed bags or containers. Residents should bring in trash cans promptly after pickup or by no later than the evening of collection Residents are limited to 2 bags or equivalent per pickup. Residents pay on for excess trash beyond the 2 bag limit. Additional trash will not be picked up unless arrangements are made in advance with the private trash contractor. Recycling is voluntary and residents may place separated recyclables except newspaper into separate bags or containers out Thursday evening for early Friday pickup. There is no regular Fall leaf pickup. Check with the Borough Secretary or Council Member s for instructions. Leaves may not be burned within the Borough. Vehicles should be registered with PA within 60 days of residency. Proof of insurance coverage is required. Vehicles may be registered at some AAA offices and other locations including the Brookville AAA office at 2888 Main St. (814) 849-5381 and Sarvey Insurance and Notary Agency, 273 Allegheny Boulevard, Brookville (814) 849-5348. The DMV in Clarion Mall does not currently provide vehicle registrations. If you move within the state you must report your address to PENNDOT within 15 days at PENNDOT, Bureu of Motor Vehicles, Harrisburg, PA 17104 or at www. state.pa.us. New Bethlehem residients may register at the Clarion County Court House, 421 Main Street, Clarion (814) 226-4000 and South Bethlehem residents at the Armstrong County Court House, on Market St. In Kittanning (724) 548-3222 or you may register when you get your driver’s license at the PA Deparment of Motor Veichles. Voting the New Bethlehem is at the back of the Fire Hall at the entrance off Spruce Street and in South Bethlehem, at the South Bethlehem Apartment House at Allison and Hamiton Streets. 1st time voters in the district must present identification on elelction day. Register at least 30 days before an election. Treatment is provided to New Bethlehem by the Redbank Valley Municipal Authority. Billing is Monthly. Bills may be paid at the Municpal Authority Building at 234A Broad Street or by mail to the address. Building rain gutters are no longer permitted to drain into the sanitary sewage system under DEP regulations. Violations cost us all more in treatment costs and may results in fines. Are you a business looking for a great location on a busy highway? New Bethlehem lies at the intersection of Routes 66 and 28, only 16-18 miles from Interstate 80. We have many low-cost available properties of varied sizes that might suit your business. Come for a visit, you’ll want to stay. 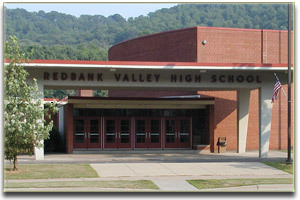 Redbank Valley School District provides the education services for the 165 square mile area of New Bethlehem and Hawthorn Boroughs, and the townships of Mahoning, Madison, Porter, and Redbank of both Clarion and Armstrong Counties. The schools are well maintained, clean, and present a pleasant educational environment. * New Bethlehem Elementary has been renamed Redbank Valley Primary School (grades k-2) and Hawthorn Elementary will now be named Redbank Valley Intermediate School (grades 3-6). School menus and carious activities are announced in The Leader-Vindicator. Specific school information is found in the Student/Parent Handbook distributed by the schools. Weather related closings are announced by KDKA Tv2/Radio AM 1020, AM 1300, FM 92.7, FM 95.9 and FM 107.3 or on the Internet at www.Cancellations.com under Redbank. The School Board usually meets at 7:30 PM in the High School Choir Room on the 1st Monday of each month with dates & times announced in the The Leader Vindicator. Nine School Board members are elected to 4-year staggered terms. There are 2 student representatives.Vacancies are filled by appointment until the next election at which time, the vacancy is filled by vote of the citizens. 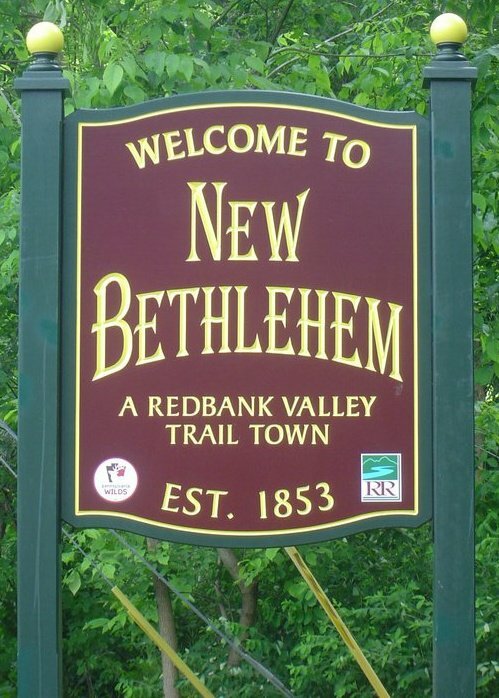 New Bethlehem residents are subject to a minimal personal tax for Clarion County and New Bethlehem which is due by 6/30 of each year with discounts of 2% offered for payments between 3/1 and 4/30, face values between 5/1 and 6/30 and a 5% penalty if paid after 6/30. Property owners must also pay real estate taxes bases on assessed values to Clarion County and New Bethlehem which are due at the same time as the personal tax with the same discounts and penalties. A school real estate tax based on assessed valuation and a minimal personal tax for the Redbank Valley School District based on occupation plus a per capita tax is due by 7/1 with a a 2% discount if paid by 8/31, face value between 9/1 and 10/31 and a 5% penalty if paid after 10/31. All taxes are paid to the local tax collector. South Bethlehem residents pay taxes to the borough and Armstrong County – discount is 2% before 5/10 face amount 5/11 – 7/12 & with a 5% penalty after 7/13 for 2004. Dates may vary in other years. The per capita tax is County $5 & Borough $10. Last day to pay is 12/31 each year. Property owners must pay real estate taxes on the same dates as above. A personal school tax for the Redbank Valley School District based on a per capita tax of $25 for the employed and $15 for the unemployed or retired and a real estate based on assessed valuation is due by July 1st. All taxes are to be paid to local tax collector. New Bethlehem is a borough on the southern border of Clarion County. Clarion County contains 34 municipalities including boroughs and townships. South Bethlehem is a borough in northern Armstrong County which has 45 municipalities. Three commissioners constitute the chief governing body of the county. The Commissioners’ office is located on the 2nd floor of the County Administration Building at 330 Main Street, Room 206, (814) 266-4000, fax (814) 226-8069. Commissioners are vested with selective policy-making authority to provide certain local serices and facilites on a county-wide basis, including appointment of personnel and fiscal management. Commissioners are responsible for the adoption of county budgets, assessment of property, levying taxes and borrowing funds for construction of capital projects. (Information from Clarion County website at www.co.clarion.pa.us). They are elected for a 4-year term, terms of the 3 commissioners run simultaneously. In the primary election, 2 Democratic and 2 Republican candidates are nominated for 3 positions. The 3 candidates who receive the highest number of votes in the following general election in November are named commissioners, however, residents are only allowed to vote for 2. They take office the 1st Monday of the following January. A candidate must be a U.S. citizen, a resident for 1 year, at least 18 years old, must present a petition properly signed by 100 qualified residents and cannot hold certain other offices. Petition request forms can be obtained from the County Board of Elections. The Armstrong County Commissioners information is similar to most of the Clarion County information. The commissioners offices are located on the 2nd floor of the Courthouse Annex on Market St. in Kittanning and can be reached at (724) 548-3215. Further information may be found at thewww.armstrongcounty.com or by calling the Armstrong County Courthouse at (724) 543-2500. The New Bethlehem Borough Council is comprised of 7 residents elected by voters for 4-year staggered terms. A candidate must be a registered voter, a resident for 1 year and must submit an application and a petition signed by at least 10 citizens to Chief Clerk County Administrator, Commissioners’ Office, 330 Main St. , Clarion PA 16214 @ (814) 226-4000. Please call for updated procedures and time deadlines. Write-in candidates must submit their names on a form to the County listing all the possible ways their names could be spelled by voters writing their names on election day for the votes to be properly counted. The council is assisted by an engineer and attorney who serves as Borough solicitor. The Borough Code contains the Borough’s laws and regulations. A copy is available at the library. It is also governed by the Borough Code in Pennsylvania law which is found in Purdon’s Statutes Annotated. A copy is available at the Clarion County Law Library in the Courthouse. 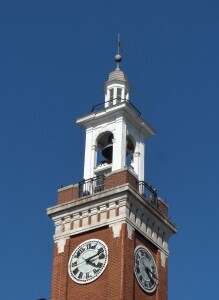 Council members serve on at least 1 committee and may hold certain other elected or appointed offices and may work as an employee of the Borough. Committees include Police, Street, Solid Waste, Cemetery, Communications, Long Range Planning, Finance and Personnel. Council meets on the 3nd Tuesday at 7:30 PM at the Alltel Building at 212 Lafayette Street. 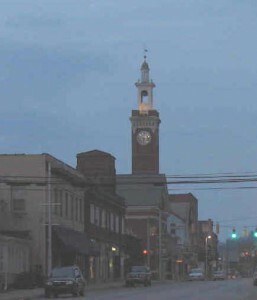 South Bethlehem Borough Council information generally mirrors the requirements for New Bethlehem. For further specific and current information, call the Armstrong County Courthouse at (724) 543-2500 and request candidate election information. Council committees include Police & Fire, Street & Sewer, Street Lighting, Building, Grounds & Zoning, Finance, Solid Waste. and Ordinances. South Bethlehem Borough Council meets on the 1st Tuesday of each month in the meeting rom of the Borough Building located at the terminues corner of Grant and Short Streets in South Bethlehem Borough. The mayor is elected by the residents for a 4-year term. The mayor has the right to veto decisions of the Borough Council. The RVMA is responsible for water and sewar and is composed of 5 members, appointed by their borough councils, who serve 5-year terms. They are assisted by an engineer and attorney. Formerly the American Legion Park, Alcola is a 33 acre site. The park is operated by a board comprised of representatives from each of the municipalities served and is funded though municipal action by the governing bodies of the communities involved. South Bethlehem participates but New Bethlehem has opted out. Recreational facilities include play equipment and a skating rink. It is also the site of the Clarion County Fair.